Sporting and Hound Group. He has won over 20 Breed Nationals. Bruce has also won Top Twenty Competitions. Bruce has judged in multiple countries including Judging Sweeps Stakes at the German Shorthair Pointer National Specialty, sweeps at many specialties, and also judging Top Twenty Competitions. 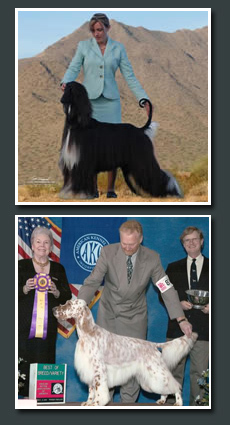 They have dedicated their lives to the sport of showing pure bred dogs. Showing dogs has given them the opportunity to work with some amazing dogs and make friendships with clients that will last a lifetime.